Non-Proprietary Name: Letrozole Tablets What is the Non-Proprietary Name? 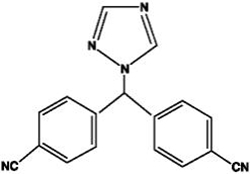 Letrozole with NDC 69117-0004 is a a human prescription drug product labeled by Yiling Pharmaceutical, Inc.. The generic name of Letrozole is letrozole tablets. The product's dosage form is tablet, film coated and is administered via oral form. FDA Application Number: ANDA205869 What is the FDA Application Number? Letrozole Tablets, USP are indicated for the adjuvant treatment of postmenopausal women with hormone receptor positive early breast cancer. [see Clinical Studies (14.2, 14.3)]. [see Clinical Studies (14.4, 14.5)]. The recommended dose of Letrozole tablets is one 2.5 mg tablet administered once a day, without regard to meals. [seeWarnings and Precautions (5.3)]. The recommended dose of Letrozole for such patients is 2.5 mg administered every other day. The effect of hepatic impairment on Letrozole exposure in noncirrhotic cancer patients with elevated bilirubin levels has not been determined. 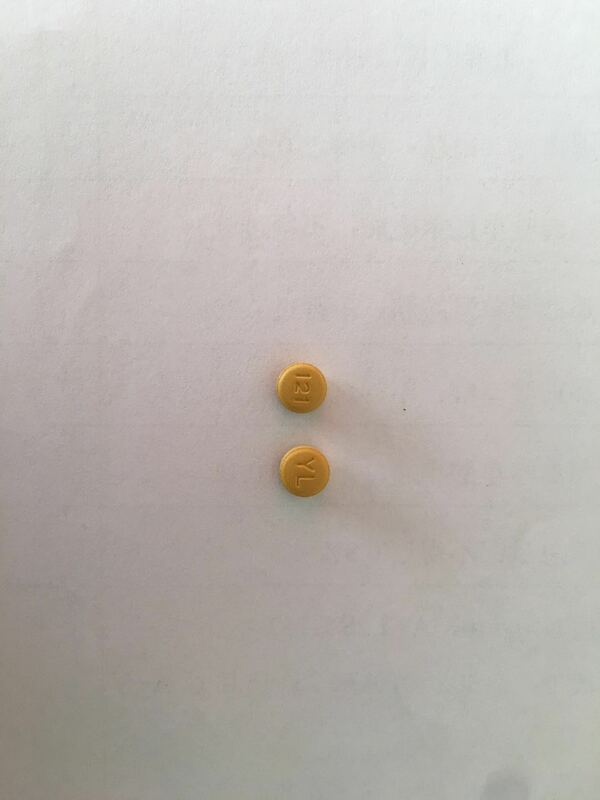 Letrozole Tablets USP 2.5 mg are yellow, round, biconvex, fil-coated tablets, debossed with '121' on one side and 'YL' on the other side. [see Use in Specific Populations (8.1)]. No dose-related effect of letrozole on any hematologic or clinical chemistry parameter was evident. Moderate decreases in lymphocyte counts, of uncertain clinical significance, were observed in some patients receiving letrozole tablets 2.5 mg. This depression was transient in about half of those affected. Two patients onletrozole developed thrombocytopenia; relationship to the study drug was unclear. Patient withdrawal due to laboratory abnormalities, whether related to study treatment or not was infrequent. [see Adverse Reactions (6.2), Use in Specific Populations (8.1, 8.3) and Clinical Pharmacology (12.1)]. This product contains FD&C Yellow No.5 (tartrazine) which may cause allergic-type reactions (including bronchial asthma) in certain susceptible persons. Although the overall incidence of FD&C Yellow No.5 (tartrazine) sensitive in the general population is low, it is frequently seen in patients who also have aspirin hypersensitivity. P< 0.0001). No patients with a normal BMD at baseline became osteoporotic over the 2 years and only 1 patient with osteopenia at baseline (T score of -1.9) developed osteoporosis during the treatment period (assessment by central review). The results for total hip BMD were similar, although the differences between the two treatments were less pronounced. During the 2 year period, fractures were reported by 4 of 103 patients (4%) in the letrozole arm, and 6 of 97 patients (6%) in the tamoxifen arm. LipidStudy: In a safety trial in 263 postmenopausal women with resected receptor positive early breast cancer at 24 months comparing the effects on lipid profiles of adjuvant letrozole to tamoxifen, 12% of patients on letrozole had at least one total cholesterol value of a higher CTCAE grade than at baseline compared with 4% of patients on tamoxifen. In another postapproval randomized, multicenter, open label, study of letrozole vs anastrozole in the adjuvant treatment of postmenopausal women with hormone receptor and node positive breast cancer (FACE, NCT00248170), the median duration of treatment was 60 months for both treatment arms. Table 2 describes adverse reactions (Grades 1-4 and Grades 3-4) irrespective of relationship to study treatment in the adjuvant study (safety population). [see Adverse Reactions (6)]. At the updated (final analysis), overall the side effects seen were consistent to those seen at a median treatment duration of 24 months. 354312 Pruritus1253Other less frequent (less than 5%) adverse reactions considered consequential and reported in at least 3 patients treated with letrozole, included hypercalcemia, fracture, depression, anxiety, pleural effusion, alopecia, increased sweating and vertigo.First and Second-Line Treatment of Advanced Breast CancerIn the combined analysis of the first- and second-line metastatic trials and postmarketing experiences other adverse reactions that were reported were cataract, eye irritation, palpitations, cardiac failure, tachycardia, dysesthesia (including hypesthesia/paresthesia), arterial thrombosis, memory impairment, irritability, nervousness, urticaria, increased urinary frequency, leukopenia, stomatitis cancer pain, pyrexia, vaginal discharge, appetite increase, dryness of skin and mucosa (including dry mouth), and disturbances of taste and thirst. 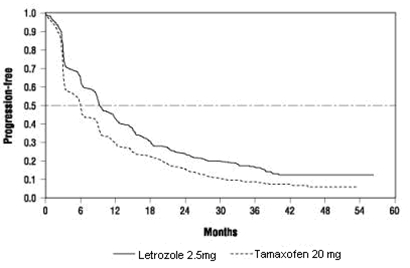 TamoxifenCoadministration of letrozole and tamoxifen 20 mg daily resulted in a reduction of letrozole plasma levels of 38% on average (study P015). 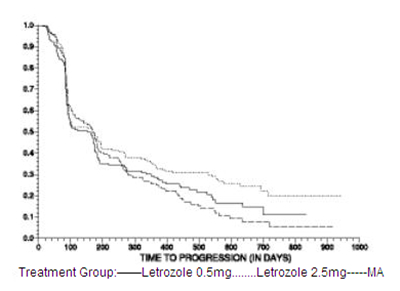 Clinical experience in the second-line breast cancer trials (AR/BC2 and AR/BC3) indicates that the therapeutic effect of letrozole therapy is not impaired if letrozole is administered immediately after tamoxifen.CimetidineA pharmacokinetic interaction study with cimetidine (study P004) showed no clinically significant effect on letrozole pharmacokinetics.WarfarinAn interaction study (P017) with warfarin showed no clinically significant effect of letrozole on warfarin pharmacokinetics.Other anticancer agentsThere is no clinical experience to date on the use of letrozole in combination with other anticancer agents. [see Contraindications (4), Warnings and Precautions (5.6), Adverse Reactions (6.2), and Clinical Pharmacology (12.1)]. (see Data). Because of the potential for serious adverse reactions in breastfed infants from letrozole, advise lactating women not to breastfeed while taking letrozole and for at least 3 weeks after the last dose. [see Use in Specific Populations (8.1)]. Females of reproductive potential should have a pregnancy test prior to starting treatment with letrozole. [see Use in Specific Populations (8.1)]. Advise females of reproductive potential to use effective contraception during treatment with letrozole and for at least 3 weeks after the last dose. The median age of patients in all studies of first-line and second-line treatment of metastatic breast cancer was 64-65 years. About 1/3 of the patients were greater than or equal to 70 years old. In the first-line study, patients greater than or equal to 70 years of age experienced longer time to tumor progression and higher response rates than patients less than 70.For the extended adjuvant setting (MA-17), more than 5,100 postmenopausal women were enrolled in the clinical study. In total, 41% of patients were aged 65 years or older at enrollment, while 12% were 75 or older. In the extended adjuvant setting, no overall differences in safety or efficacy were observed between these older patients and younger patients, and other reported clinical experience has not identified differences in responses between the elderly and younger patients, but greater sensitivity of some older individuals cannot be ruled out.In the adjuvant setting (BIG 1-98), more than 8,000 postmenopausal women were enrolled in the clinical study. In total, 36% of patients were aged 65 years or older at enrollment, while 12% were 75 or older. More adverse reactions were generally reported in elderly patients irrespective of study treatment allocation. However, in comparison to tamoxifen, no overall differences with regards to the safety and efficacy profiles were observed between elderly patients and younger patients. are available as 2.5 mg tablets for oral administration. InactiveIngredients: colloidal silicon dioxide, hypromellose, lactose monohydrate, magnesium stearate, microcrystalline cellulose, polyethylene glycol/macrogol, polyvinyl alcohol, sodium starch glycolate, talc, titanium dioxide, and the following color additives: yellow iron oxide, FD&C Yellow #5/Tartrazine Aluminum Lake, FD&C Yellow #6/Sunset Yellow FCF Aluminum Lake, FD&C Blue #2/Indigo Carmine Aluminum Lake. The growth of some cancers of the breast is stimulated or maintained by estrogens. Treatment of breast cancer thought to be hormonally responsive (i.e., estrogen and/or progesterone receptor positive or receptor unknown) has included a variety of efforts to decrease estrogen levels (ovariectomy, adrenalectomy, hypophysectomy) or inhibit estrogen effects (antiestrogens and progestational agents). These interventions lead to decreased tumor mass or delayed progression of tumor growth in some women.In postmenopausal women, estrogens are mainly derived from the action of the aromatase enzyme, which converts adrenal androgens (primarily androstenedione and testosterone) to estrone and estradiol. The suppression of estrogen biosynthesis in peripheral tissues and in the cancer tissue itself can therefore be achieved by specifically inhibiting the aromatase enzyme.Letrozole is a nonsteroidal competitive inhibitor of the aromatase enzyme system; it inhibits the conversion of androgens to estrogens. In adult nontumor- and tumor-bearing female animals, letrozole is as effective as ovariectomy in reducing uterine weight, elevating serum LH, and causing the regression of estrogen-dependent tumors. In contrast to ovariectomy, treatment with letrozole does not lead to an increase in serum FSH. Letrozole selectively inhibits gonadal steroidogenesis but has no significant effect on adrenal mineralocorticoid or glucocorticoid synthesis.Letrozole inhibits the aromatase enzyme by competitively binding to the heme of the cytochrome P450 subunit of the enzyme, resulting in a reduction of estrogen biosynthesis in all tissues. Treatment of women with letrozole significantly lowers serum estrone, estradiol and estrone sulfate and has not been shown to significantly affect adrenal corticosteroid synthesis, aldosterone synthesis, or synthesis of thyroid hormones. In human microsomes with specific CYP isozyme activity, CYP3A4 metabolized letrozole to the carbinol metabolite while CYP2A6 formed both this metabolite and its ketone analog. In human liver microsomes, letrozole inhibited CYP2A6 and CYP2C19, however, the clinical significance of these findings is unknown. Specific PopulationsPediatric, Geriatric and Race: In the study populations (adults ranging in age from 35 to greater than 80 years), no change in pharmacokinetic parameters was observed with increasing age. Differences in letrozole pharmacokinetics between adult and pediatric populations have not been studied. Differences in letrozole pharmacokinetics due to race have not been studied. 0-24hr levels in rats were 80 times higher than the level in breast cancer patients at the recommended dose. The benign ovarian stromal tumors observed in mice and rats were considered to be related to the pharmacological inhibition of estrogen synthesis and may be due to increased luteinizing hormone resulting from the decrease in circulating estrogen. P = 0.002; SDFS: HR 0.83; 95% CI (0.70, 0.97); TDM: HR 0.73; 95% CI (0.60, 0.88); OS: HR 0.86; 95% CI (0.70, 1.06). Censored analysis censors follow-up at the date of selective crossover in 632 patients who crossed to Letrozole or another aromatase inhibitor after the tamoxifen arms were unblinded in 2005. Figure 1 shows the Kaplan-Meier curves for Disease-Free Survival Monotherapy AnalysisDFS events defined as loco-regional recurrence, distant metastasis, invasive contralateral breast cancer, or death from any cause (i.e., definition excludes second non-breast primary cancers).The medians of overall survival for both arms were not reached for the MAA. There was no statistically significant difference in overall survival. The hazard ratio for survival in the letrozole arm compared to the tamoxifen arm was 0.87, with 95% CI (0.75, 1.02) (see Table 7).There were no significant differences in DFS, OS, SDFS, and Distant DFS from switch in the Sequential Treatments Analysis with respect to either monotherapy (e.g., [tamoxifen 2 years followed by] letrozole 3 years versus tamoxifen beyond 2 years, DFS HR 0.89; 97.5% CI 0.68, 1.15 and [letrozole 2 years followed by] tamoxifen 3 years versus letrozole beyond 2 years, DFS HR 0.93; 97.5% CI 0.71, 1.22).There were no significant differences in DFS, OS, SDFS, and Distant DFS from randomization in the Sequential Treatments Analyses. 20.00003 Local Breast Recurrence922 Local Chest Wall Recurrence28 Regional Recurrence74 Distant Recurrence55920.61 (0.44 - 0.84)0.003 Contralateral Breast Cancer1929 Deaths Without Recurrence or Contralateral Breast Cancer3038CI = confidence interval for hazard ratio. Hazard ratio of less than 1.0 indicates difference in favor of letrozole (lesser risk of recurrence); hazard ratio greater than 1.0 indicates difference in favor of placebo (higher risk of recurrence with letrozole). 2Analysis stratified by receptor status, nodal status and prior adjuvant chemotherapy (stratification factors as at randomization). 3DFS events defined as earliest of loco-regional recurrence, distant metastasis, contralateral breast cancer or death from any cause, and ignoring switches to letrozole in 60% of the placebo arm. P = 0.001). However, in the updated DFS analysis (interval between randomization and earliest event of loco-regional recurrence, distant metastasis, contralateral breast cancer, or death from any cause) the treatment difference was heavily diluted by 60% of the patients in the placebo arm switching to letrozole and accounting for 64% of the total placebo patient-years of follow-up. Ignoring these switches, the risk of DFS event was reduced by a non-significant 11% (HR 0.89; 95% CI 0.77, 1.03). There was no significant difference in distant disease-free survival or overall survival. P = 0.5136 (i.e., there was no significant difference between treatment arms in overall survival). P-value 0.5136. Study design allowed patients to cross over upon progression to the other therapy. Approximately 50% of patients crossed over to the opposite treatment arm and almost all patients who crossed over had done so by 36 months. 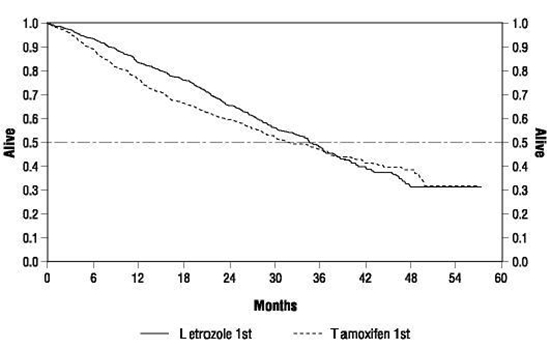 The median time to crossover was 17 months (letrozole to tamoxifen) and 13 months (tamoxifen to letrozole). 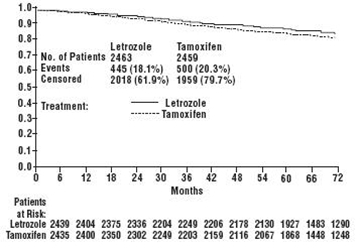 In patients who did not cross over to the opposite treatment arm, median survival was 35 months with letrozole (n = 219, 95% CI 29 to 43 months) vs 20 months with tamoxifen (n = 229, 95% CI 16 to 26 months). Packaged in HDPE bottles with a safety screw cap.Letrozole Tablets, USP 2.5 mg tablets Bottles of 30 tablets...................................................................................NDC 69117-0004-1Store at 20°C to 25°C (68°F to 77°F); excursions permitted to 15°C to 30°C (59°F to 86°F) [see USP Controlled Room Temperature]. and somnolence was uncommonly reported, caution is advised when driving or using machinery.